"Whilst we are closed to anglers at this time of year, December was a very busy month for us. Since taking over Bears Lake in late-September last year, we have established a plan to take the fishery forward in the future. Part of the plan is three key management tasks. The first of these relates to undertaking work to improve the far bank margin. This is one of the key features of the lake and has many fish holding features. It is also used by some anglers to bait up and is also used by others for stalking. Whilst it remains a key feature of the lake, there is some evidence of erosion along with a reduction in marginal flora. To address this, we have established a series of vertical posts along this margin with horizontal lengths of willow intertwined. In the next few weeks we will begin to back fill behind the willow. We also intend to plant some already established marginal plants which we will take from an area of marsh below the dam. This work should greatly enhance this margin with improvements to the bank profile and marginal vegetation. The work should also improve this habitat for invertebrates and provide an improved feeding habitat for the carp. The second key management task is the application of 3.75 tons of aquatic chalk (Siltex) across the lake. As far as we are aware, this is the first application of Siltex to the lake and one which we believe will result in an enhancement to the lake ecosystem. Whilst our water quality monitoring has indicated that the lake has a very good water quality there is some silt accumulation in the south-east corner. We have already removed several tons of accumulated silt from this corner by hand and we are now in a position to apply the aquatic chalk. 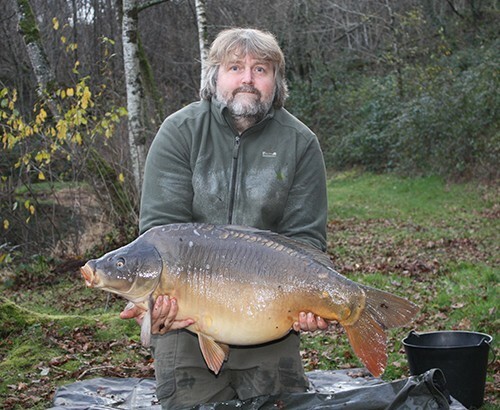 As any of our current anglers know, the lake is also surrounded by woodland with some trees overhanging the lake. These overhanging trees, whilst creating fantastic fish holding features result in significant leaf fall in the autumn period. Whilst we try to remove as much of this as possible, some inevitably accumulates on the lake bed. The deposition of such organic material on the lake bed can result in a decrease in oxygen and an increase in acidification. The application of aquatic chalk starts the process of neutralisation and aeration by penetrating the bottom layers of silt which have built up. This creates a medium where bacterial break down by aerobic micro-organisms can take place. The alkalinity of the chalk can reduce acidity of the material and provide essential calcium for plant and animal organisms. Levels of silt are reduced and more water depth should be created. This is really a task at Bears Lake which will be completed in January and so we will provide updates in subsequent reports of any benefits that we note following the aquatic chalk application. Finally, we have established a daily winter feeding programme for the fish. Again, this is the first time that this has been undertaken on a formal basis at Bears Lake. As with many fisheries, part of this winter feed will be a lower protein content purpose designed winter pellet. In addition, we are also feeding wheat with molasses along with crushed maize with vanilla. Wheat and Maize have long been used by French fish farmers in the winter period. Wheat in particular is renowned for ensuring that the fish are peak condition after the winter period. In addition to the ongoing management work at the lake, I take any opportunity that I can to fish for a few hours. It is important that I learn to fish the lake myself so that I can help anglers to get onto the fish as soon as possible when they come on holiday. The start of December was cold and there was very little sign of any fish activity. The weather, however, warmed significantly from 13th December and signs of feeding fish were evident. My approach to fishing was largely dictated by the management work at the lake. As such, I would bait with 1-2kg of boilies in the morning and then undertake what management work I had to do before fishing in the afternoon from approximately 14:00 until 17:00. Rather than bait tightly, the boilies were scattered over an approximate 50m x 20m area in the deeper part of the lake. Rigs were standard bottom bait rigs with single 20mm Carp Cuisine Spicy Fish boilies fished on a Korda Kurv Shank Size 2. The hook link was a relatively short 15cm length of ESP Brown Camo Sink Link with additional tungsten putty midway along. Leads were 1.5oz Korda Pear Swivel. Everything was pinned down further with 60cm of Korda Dark Matter Tubing (Gravel Brown) along with a flying back lead. 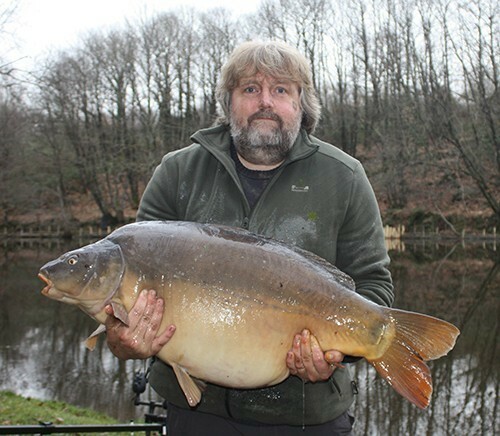 On the 13th I landed two Mirror Carp, the first 26lb 13oz and the second 34lb 11oz. This mid thirty started a run of good fish and on the 14th in a 1.5hr period I landed further fish of 39lbs exactly, 34lb 3oz and 48lb 4oz (all mirrors). The big fish continued to feed on 15th with a Mirror of 38lb 12oz and a Common of 37lb 3oz. Temperatures fell slightly after this period but further fish were caught on 17th (18lb 13oz Mirror) and 18th (25lb 3oz Common and 36lb 1oz Mirror). 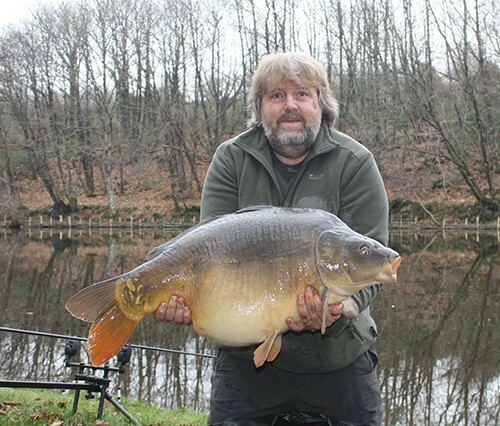 This great run of fish highlights what is possible in December given good conditions. It certainly would have been interesting to see how many other fish would have been caught if I had been able to fish longer sessions. The number of big 30’s is also very encouraging. All of these fish appear to have some way to grow and I hope that the combination of lake management and improved feeding will enable them to push through into the 40lb+ category in the next year or so. Following a week back in the UK at Xmas, I returned to the lake on 28th December. We had hoped to welcome well known German angler Tobias Brunkhorst and his in girlfriend to the lake for a week’s fishing around New Year but unfortunately he had to cancel at the last minute. 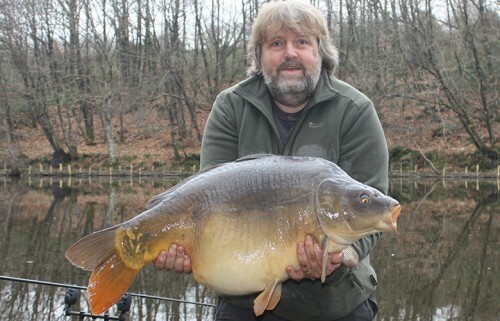 It would certainly have been interesting to have an angler of his calibre fish the lake and hopefully he will be able to do so in the future. We are now into January and I will provide an update on ongoing work and fishing at the month-end. Strictly not for this report, I did, however, manage my first short fishing session yesterday afternoon (4th). 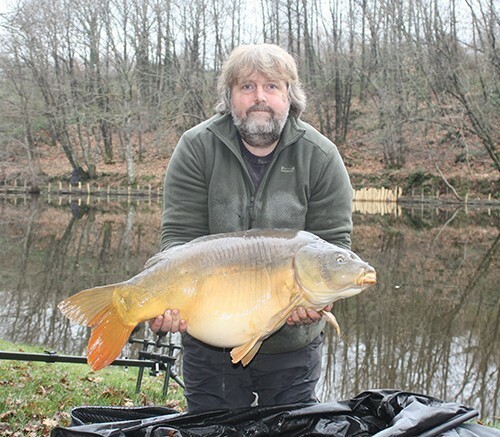 Amazingly, I broke the lake’s catfish record just ten minutes after casting out and followed this up later with a beautifully conditioned 34lb 1oz Common."